There's been a big build up to Halloween for us this year. We've already both dressed up, with costumes that still fit us from last year. 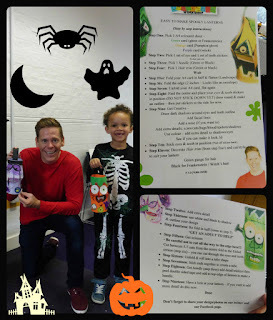 We've already done some Halloween Crafts, with Lloyd Warbey (Art Attack) no less (see the "how to" instructions in the photo to the left for Spooky Halloween Paper Lanterns). Mars Bar *no bake* Cake, as a warm up. Halloween Cupcakes decorated with M&Ms. Devil's Food Cake using Galaxy as the melted chocolate. The Mars Bar Cake (<< recipe) was a great one to kick off my baking session with this afternoon as it is speedy, indulgent and does not require any skill or baking. So, it gave this Can't Cook Won't Cook lady the confidence to carry on. 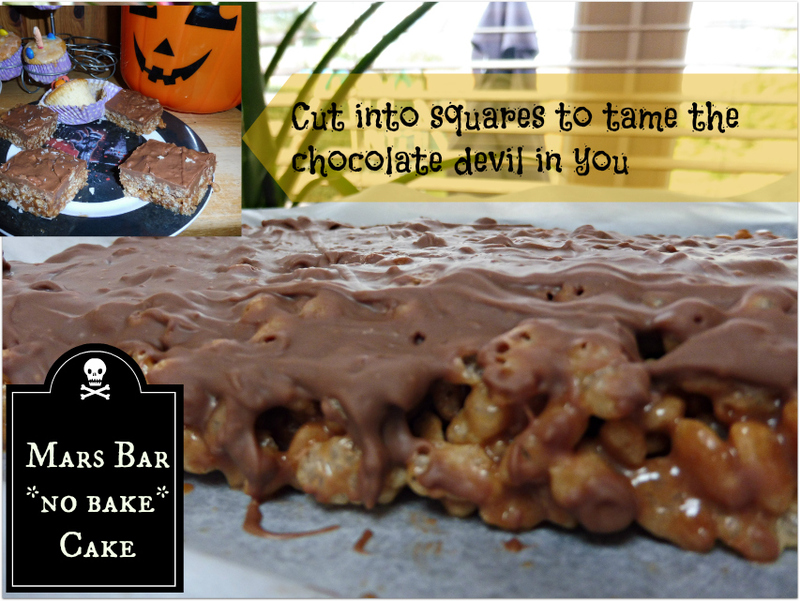 It's devilishly divine - perfect for Halloween and perfect for chocolate lovers. The only variations I made to that recipe are (a) I chilled it in the fridge instead of just to room temperature as it is delicious that way and perfect then to cut and (b) the melted chocolate I used was a 200g bar of Galaxy, which was just perfect! Perfect for melting and perfect for eating. I find that you can melt the chocolate directly in a frying pan, providing your gas is at its absolute lowest, the pan is non-stick and you keep moving the chocolate, with a wooden or plastic spatula. No need for a bowl over steam - at least it worked a treat with Galaxy this afternoon that's for sure! I did all of my baking food shopping in the Co-operative this morning, except I had to go back a second time just before the school run as I had forgotten cocoa powder (rookie error) and Daddy had to go again for me when I was making the Devil's Food (chocolate) cake as I did not buy enough Whipping Cream. Never having made a two tier cake before (neither Victoria Sponge nor Chocolate) I didn't own and needed to buy, 2 x round 8 inch tins, which I purchased in the Factory Shop. Yep, it was a busy morning. Along with ingredients, when I went back to Co-op to get the cocoa powder I couldn't resist a pack of Halloween cake decorations. You can see them below on the cupcakes - they were £2 for a pack of 9 - quite pricey but they are very effective, taste nice and are great if you are only making one batch. 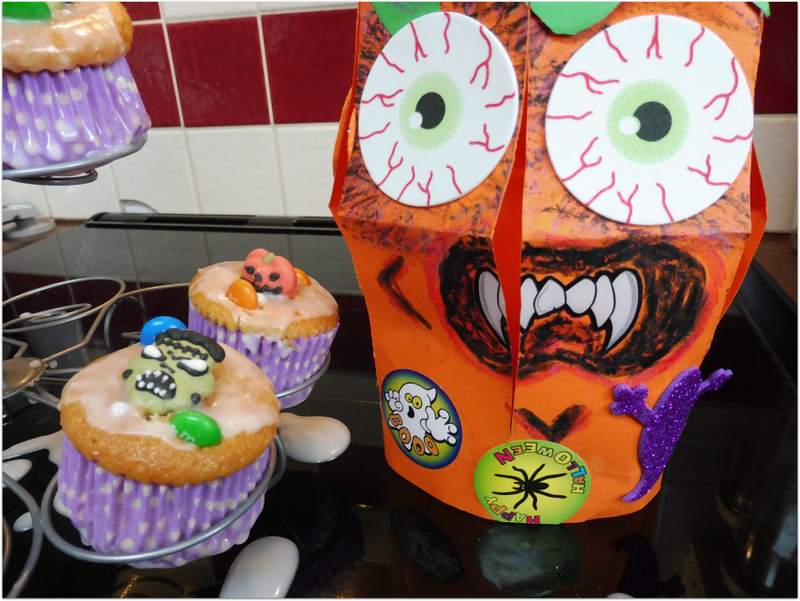 They certainly gave our cupcakes the spooky factor and made a huge impression on Aaron when he came home from school. Today was his last day, so he has a week and a half off now for Halloween, which is a very welcome break indeed. Considering I got a Corneal Abrasion yesterday morning and have breathing problems at the moment; as well as being pregnant of course. So with it being the last day of term it was the perfect evening tonight to have a bit of a Halloween celebration. Aaron was definitely on a high when he got home, as not only did he have cupcakes to ooh and aahhh at but he also loved the Mars Bar Cake and ate two squares. He's not into sweets really at all, but chocolate is definitely his big weakness. Then, thanks to me forgetting the cocoa powder on the morning shop he was here to see me make the two tiers of the chocolate cake and he loves to help me bake. I am not that familiar with icing so we applied it when it was still too runny, hence the mess AND I let Aaron do it himself - I know I know I know, but it was fun and I don't regret it. I'd made the cupcakes in the morning but hadn't topped them yet prior to collecting him. Aaron's hand is blocking it, in the picture above, but we got an amazing Halloween doorbell in Aldi (on Special Buy) with the food shop a few weeks ago. Can't wait to see and hear it in action with our visiting Trick or Treaters AND to see that pumpkin bucket above FULL of sweets. Last year we spent the day at a farm carving pumpkins (I think it was the hottest Halloween in 60 years - it was 23 degrees) and then did Trick or Treat when we got home. BUT it was a Trick or Treat with a difference - it was us (in costume) answering the door to people. Inside the door we had a lit up carved pumpkin and LOADS of sweets to share with our visitors. 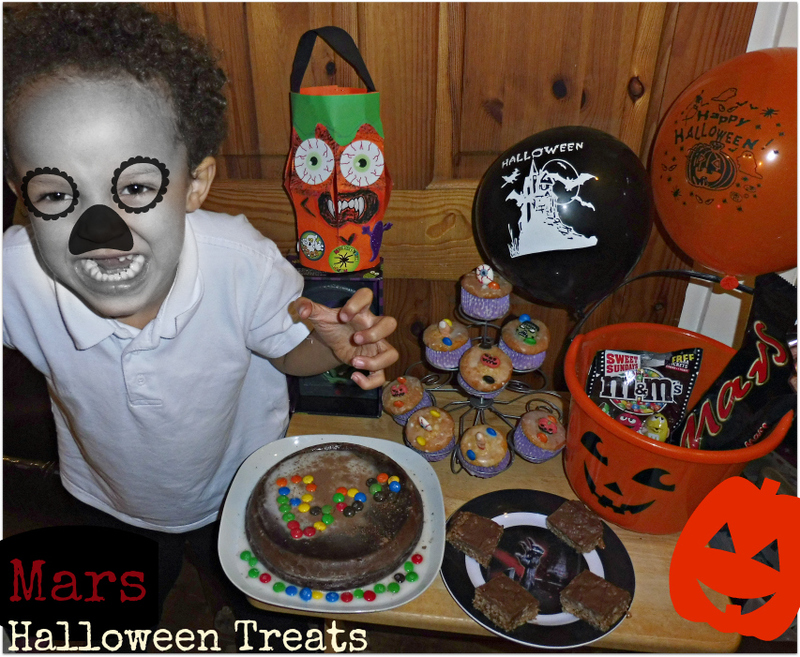 Aaron had so much fun answering the door and issuing the sweets, that I'd say it rivals pacing the streets yourself (which we have done it a previous year). Certainly worth considering, if there's a reason you can't get out, but you want to participate in the joys of the season. The visiting kids love having enthusiastic dressed up people answering the door. Well of course they do, considering some people don't answer the door at all. If you want visitors, be sure to decorate your front door as it lets Trick or Treaters know that they are welcome. Having paced the streets myself, I know it is a joy to see a decorated house - the year we did it, my heart was warmed by the generosity of people. 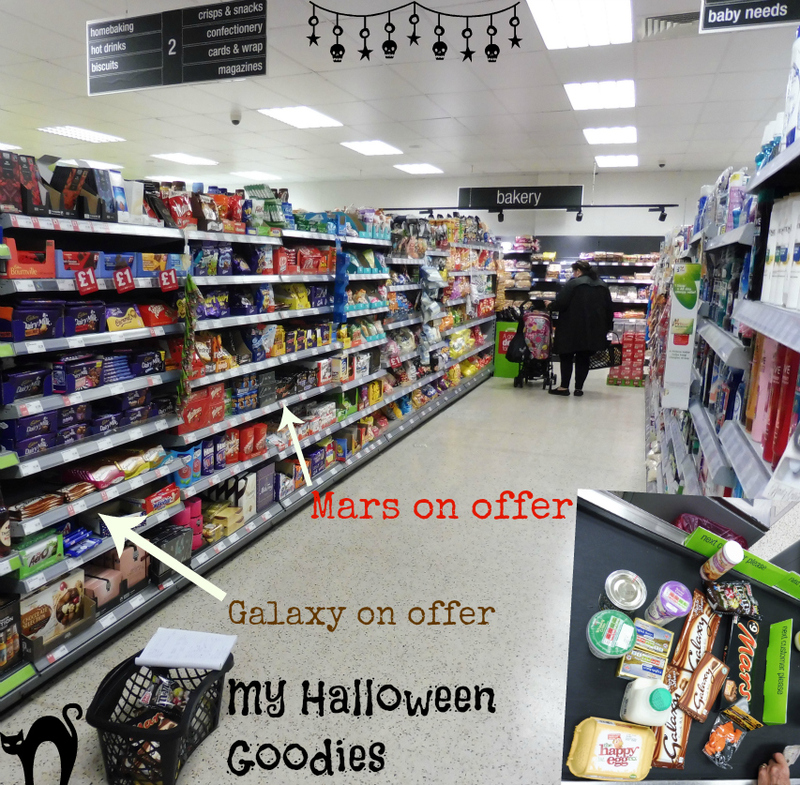 I had no idea that so many people participate AND go to the trouble of having Halloween themed sweets in stock at home especially. It restores your faith in the sense of community, that is actually still there, when you scratch the surface of the isolation of front doors and barriers. Back to the baking! I should add that I do not have one of those proper cake mixers - you know the sort... a bowl, with whisks that come down into it. They can be as much as £300 so I am not going to pop out and buy one anytime soon. So, how I get round this is, I use my Vitamix. The trick is, the butter MUST be room temperature and not straight from the fridge. Also, it must be creamed into the dry ingredients and/or cut into small chunks. You also have to get right, when to add the wet ingredients and in between pulsing, use a spatula, to help move dry ingredients from the side. Other than those pointers, it works extremely well. So I am quite an accomplished baking hacker today, if only I could have got the Devil's Food Chocolate Cake frosting right. I don't think I have earned the right to call it ganache yet! The creation that looks like a bowl of drinking chocolate is still in my fridge actually and rather than chilling to frosting consistency, it is now like a whipped mousse!!!! Tomorrow I may just find a use for it, or I know Daddy and his sweet tooth will... As I type this, he and Aaron are asleep, so I think they will raid what is left of my Halloween eats and treats tomorrow. Daddy was too full after dinner to even have pudding tonight. Do you know about Mars's Sustainable Cocoa Initiative? It is fascinating reading about the cocoa supply chain and to see how many stakeholders are involved. It is only by treating the farmers well, that they can afford to invest in their farms and ensure the long term supply of adequate quantities of cocoa. It is great to see this being made a priority.